Maneuver. Plays in your core. 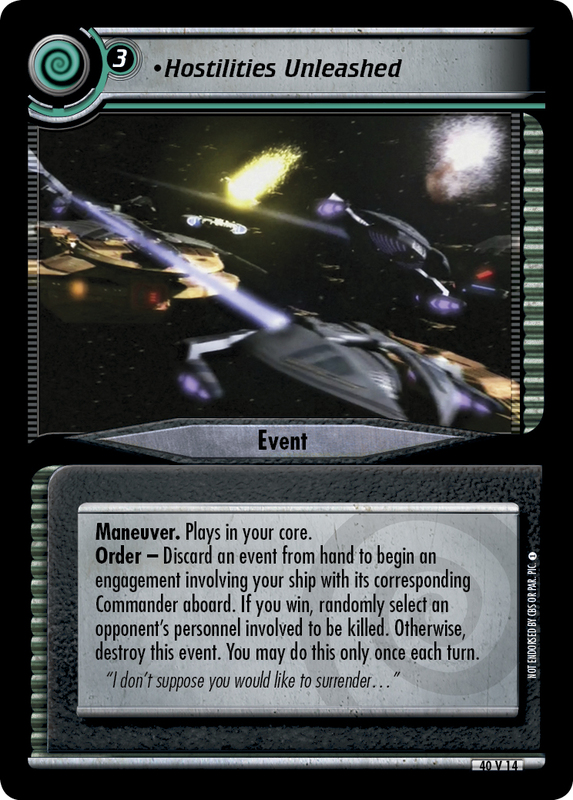 Order - Discard an event from hand to begin an engagement involving your ship with its corresponding Commander aboard. If you win, randomly select an opponent's personnel involved to be killed. Otherwise, destroy this event. You may do this only once each turn. "I don't suppose you would like to surrender..."
Characteristics: engagement, kill opponent's personnel, plays in your core, discard an event from hand, Maneuver, ship related card. Card logging info: First edited by Telak at Jul 29th, 2017. Please support openCards and validate game text of this card! No "reprints" for this card (no cards published with same title & sub-title in other expansions). Log in OR create a new account to write a card review. There are no decks with this card this time.Create your own Deck in the ST2E deck section! Because this is a virtual non-promo card, it's not listed in the Tradeplace.